I broke my own rule when I checked this book out of the library, but I just couldn't stop myself. You might recall that I recently raved about Black Water Rising, Attica Locke's first mystery novel. And here I am again, less than a month later, urging you to read yet another book by the masterful Ms. Locke. Now that I'm blogging, I typically don't let myself read multiple books by the same author in quick succession. It's probably a dumb rule (and the fact that it's self-imposed makes it more ridiculous), but I figure once I've touted an author on my site, I don't need to mention them again for a while. If their work sounds good to you, you'll probably go check out their other titles on your own, right? You don't need me blabbing on and on about the same old writers. I try to keep up a steady stream of variety, always within the bounds of my own quirky taste of course. I read for myself, but I also read for you. The problem is I'm addicted to Attica Locke's delicious alchemy of spine-tingling mystery and real-world relevance. Her stories are couched in current, vital issues, so you're not only getting loads of suspense, you're also engaging with the stuff in our world that matters. 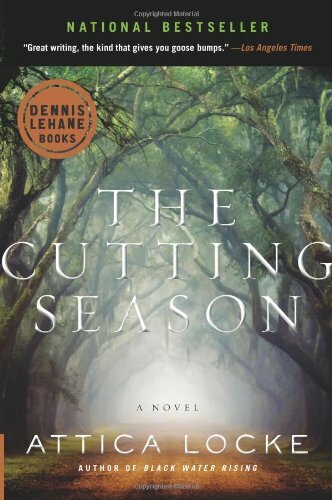 Case in point: The Cutting Season takes place on a former slave plantation in Louisiana. Caren Gray manages the property, now a tourist and school field trip destination, on which her ancestors were once forced to labor. How's that for some cognitive dissonance? When the body of a migrant field worker turns up near the old slave quarters, Caren has bigger challenges than just rescheduling that day's tours. She's suddenly caught up in a storm of long-held secrets and political power plays. Her own family's past is somehow inextricably tangled up with the fate of the dead woman, and someone is desperate to keep Caren from connecting the dots. What are you doing still sitting here?! Get thee to the library, and get thee some Attica Locke!